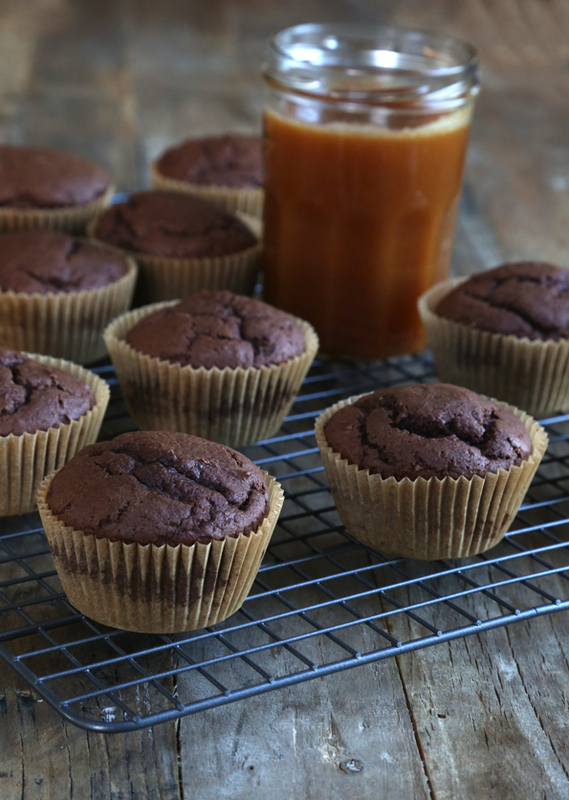 Starbucks Style Gluten Free Chocolate Caramel Muffins | Great gluten free recipes for every occasion. It appears that I’m on a Starbucks copycat recipe kick (remember yesterday’s Gluten Free Asiago Bagels?). 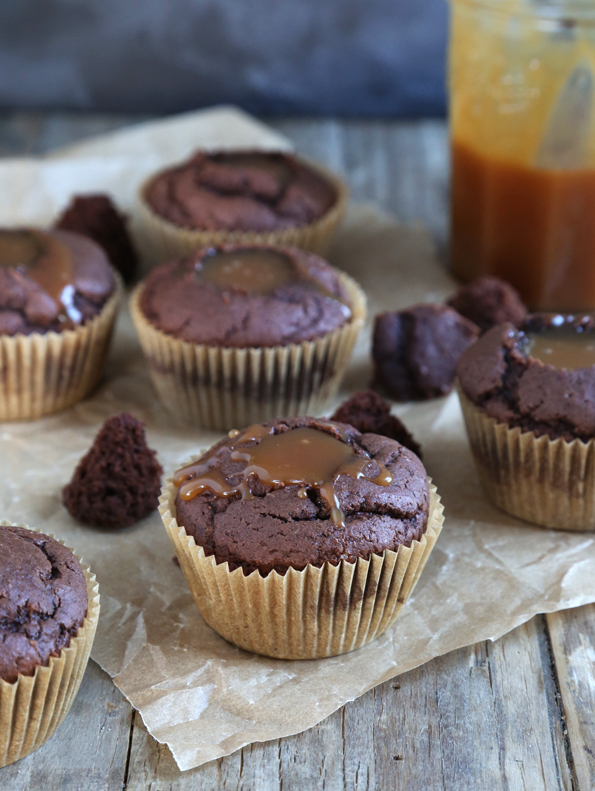 Today it’s Starbucks-Style Gluten Free Chocolate Caramel Muffins. When I shared the recipe for Starbucks-Style Outrageous Gluten Free Oatmeal Cookies, one of you whip-smart readers said, hey, what about their chocolate caramel muffins? I’m pretty sure I got right to work on that recipe the very same day. Can you blame me? Just look at those tender chocolate muffins (not too sweet!) and the drippy, gorgeous caramel (yes, sweet!). And they were the ones who decided to call it a muffin. So it’s fit for breakfast. Starbucks Says So. I love writing copycat recipes (my publisher didn’t want to call the book “Copycats” or “Clones” or “Mock” anything, so we’re still working on, well, a working title—suggestions anyone?). It’s a big, fat, fun challenge for me (make it taste just like the original! ), and it cuts right to the heart of why I really love developing gluten free recipes in the first place: to give you back what you thought you had lost forEVER. But for at least half of every year for the last 4+ years, I’ve been hard at work developing recipes … that I can’t share with you at ALL since they’re for the next cookbook (yay! good problem to have, for sure). Since I’m also sharing new recipes most days on the blog, I can stay calm and not spill new recipes nearly a year before they hit the bookstore shelves. But what really helps is to take the concept (copycat recipes) and share recipes that are of a category that I don’t plan to write about for the new cookbook. So, the new new cookbook (Bakes Bread is still new, right?) is filled with chapters like Cookies (Mallomars and Vienna Fingers! ), Crackers & Other Savory Crunchy Snacks (Cheese Nips and Club Crackers! ), Snack Cakes (Sno Balls and Devil Dogs! ), Breakfast & Fruity Treats (Pop Tarts and Fig Newtons! ), and Candy (Twix and Ferrero Rocher!). Starbucks baked goods don’t fit in any of those chapters, right?! So they’re fair game for the blog. Which means that, in my head at least, I feel like I am sharing something of a sneak peek of the new new cookbook with you, except not really. Before we get to the recipe, I do have to warn you: these are better than you even think they are. 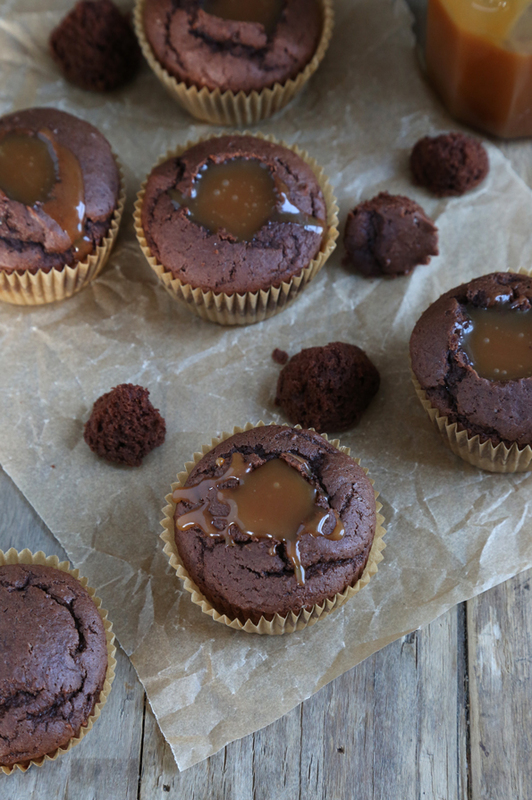 The chocolate muffins are not overly sweet at all, so when the sweet caramel sits in the hole at the top of the muffin, it soaks into the muffin itself. 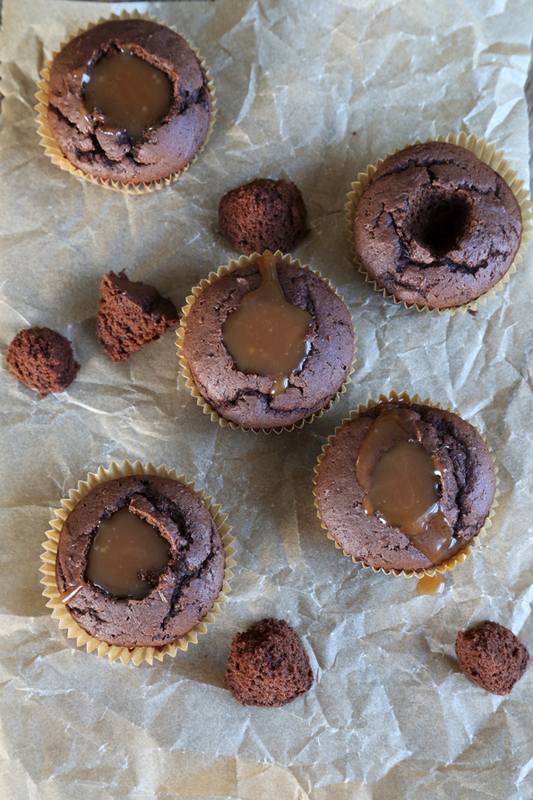 It makes for an impossibly tender muffin with the best chocolate-caramel flavor you’ve ever experienced. Those Starbucks people might make some hard-to-love coffee (sorry, fans! ), but they do know how to bake. Luckily, I’m hell-bent on making it all gluten free for us. In a medium-size bowl, place the flour, xanthan gum, cornstarch, cocoa powder, baking powder, baking soda and salt, and whisk to combine well. In the bowl of a stand mixer fitted with the paddle attachment or a large bowl with a handheld mixer, place the butter and beat on medium-high speed until light and fluffy. Add the vegetable oil, melted chocolate, molasses and sugar, and beat to combine well. Add the eggs and vanilla, and beat again to combine well. Add the dry ingredients to the mixer, alternating with the buttermilk, mixing to combine after each addition and beginning and ending with the dry ingredients. The mixture will be thick, but somewhat fluffy. Remove the bowl from the mixer, add the chips mixed with cornstarch, and mix until the chips are evenly distributed throughout the batter. Fill the prepared wells of the muffin tin about 3/4 of the way full with batter. Shake back and forth and side to side to spread the batter into an even layer in each well. Place in the center of the preheated oven and bake until a toothpick inserted in the center comes out clean or with a few moist crumbs attached (about 20 minutes). Remove from the oven and allow to cool for 10 minutes in the pan before transferring to a wire rack to cool completely. While the muffins are cooling, make the caramel filling. Place the caramels and heavy whipping cream in a small, microwave-safe bowl, and melt on 60% power in the microwave in 30-second bursts, stirring in between, until melted and smooth. 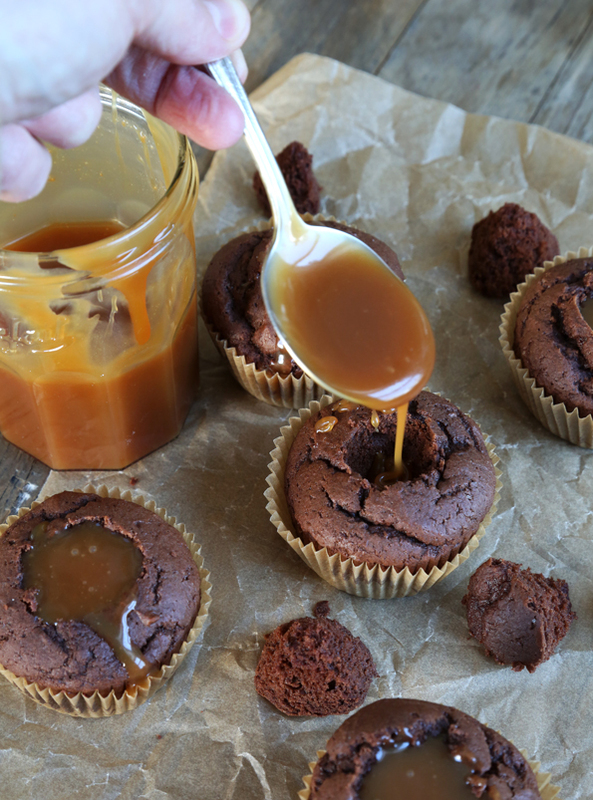 Once the muffins are cool, with a paring knife, cut a cone shape out of the center of each muffin and fill with the caramel until it just begins to drizzle out a bit. Allow to set at room temperature and serve. I wanted to make a suggestion for a title for your next copycat cookbook. How about “I can’t believe it’s not _______________” (Nabisco, Starbucks, etc.) It strikes me that the gf baking that you do evokes this sentiment when you’re sinking your teeth into something delicious again! I’ve sampled the worst of gf since my diagnosis 10 years ago! Just a quick question as to what you have found the best way to freeze your cupcakes/muffins is…and the best way to defrost/re-heat? Thank you so much…all of the work you put into your trade makes our lives so much sweeter! Oh Wow! The perfect Valentine treat! How about GFOAS Classics Remastered! Thanks for this yummy recipe Nicole! How about “GFOAS’s ‘Better Than’ Cookbook” or “GFOAS Remixed”? Whatever you call it, I can’t wait to get it! Gluten-Free Desserts and Snacks: GFOAS Recreates the Classics! I wish you much success on your title quest. After pouring over synonyms for copycat, clone, and mock, I can see why you’re still struggling to come up with a working title!! Regardless, it sounds like another book to purchase! For the title: Upgrade the Classics to Gluten Free. Or– Cupcakes and Muffins and Cookies, Oh My! Or–Yes, I swear this is gluten free! and other phrases you will catch yourself saying after using these recipes. :) Love your books and your posts! I know what I’ll be making right after I finish my loaf of your Starbucks GF chocolate cinnamon bread! GFOAS Familiar Favourites: Snacks and Treats you thought you’d lost forever! While you are doing copy cats, have you tried Udi’s Maple Pecan Chocolate Chip cookies ?? My Hubby really likes them and I can’t find them anymore. I haven’t, Carole. I don’t generally copycat treats that are already gluten free. Sorry! OK…did I read right on Facebook that it is not going to have Gluten Free on a Shoestring in the title? Title: GFOAS Cooks Better than you remember. Love your other books. Can’t wait for the next one. I was thinking about some twist on “Better Than,” too. Ohhh!!! Can we preorder yet? All of these copy cat recipes coming our way…I can hardly stand it!!! – GFOAS recreates your favourite coffeehouse classics. You can definitely make crullers with the Yeast-Raised Donuts recipe in Bakes Bread, Monica! No preorder yet. We haven’t even had the photo shoot yet so no cover. But I’ll be sure to let you know–and thanks for the book title ideas! I make a chocolate cake where i melt caramel into the cake. These sound just as delicious, if not better beause it’s not instant box cake :) And it looks like the caramel doesnt get completely absorbed. Mmmm… I am so excited for your new book! Ive been steadily baking my way through Bakes Bread. Ive made LOTS of mistakes, but Im learning, and the successes are so worth it. The new book will have that awesome copy cat for the Entenmann’s NY Style Coffee Cake, right Nicole? That recipe will be worth the price of the book alone, I just know it! Oh, Nicole we really would get along so well. I do not do Starbucks coffee either! I have been craving chocolate and caramel lately. This is going on Saturday’s baking list! Not meant to be funny. I really mean it – you are such an artist! Hi, I’m waiting for all three of your books to arrive. Amazon sez Thursday. I have all my supplies, courtesy of that place in Montana, but I thought I’d make the sourdough starter while I’m waiting. Couldn’t find a recipe for it here. BTW, did you know about those Italian researchers who’ve applied for a patent (in 2010) for a sourdough starter they developed (2 types of “maize” flour, rice flour and buckwheat flour plus various lactobacillus) that manages to predigest the threatening proteins and renders wheat flour breads tolerable for celiacs? No joke. Must be why when living in France I found the Pain au levain very digestible. And I’ve been celiac for nearly 30 years. Also, I adapted your peanut butter cookie recipe for almond butter (loved the saltiness) and loved it. And your Nilla wafer cookie recipe for lemon cookies (which i roll in 10X sugar and flatten before baking) – yum. Anyway, look forward to your books arriving. Any help with the wild yeast (sourdough?) starter now would be nice. I think that is junk science, I’m afraid, and dangerous for celiacs. I would stay as far away from that as possible! I’m afraid that I’m not able to give you the directions to make the wild yeast sourdough starter. I’m very limited in the amount of information published in Bakes Bread that I am able to give away. The book will be there soon! I got a “blocked ” message from your site trying to comment after your books arrived yesterday. Wondering why. I just love a good alliteration. I’m gonna need some time to think of names but of course your teasing us with this new fab cookbook when it is over a year away is making me stubborn!! LOL! This recipe looks way too good to be true, yum-o! Guess what I made this weekend on top of frosted heart soft sugar cookies and ‘wheat’ thins? You got it – stuffed bread sticks!! 8 with hotdogs and 6 with cheesesticks from one recipe. The fam loved it to pieces!!! Oh yum! I haven’t had time to try the stuffed breadsticks yet- I am envious! Do you think the egg substitutes would work? Or just egg whites? I’m a no gluten, dairy or egg yolk girl. I guess it depends upon the egg substitute, Wendy. I’m afraid I haven’t tested it egg free, so I don’t really know! Generally, my favorite egg substitute is a chia egg (1 tablespoon white chia flour + 3 tablespoons water, gelled). You’ll have to experiment, though! Wendy – I actually replace the eggs in a recipe with egg replacement (egg beaters, etc…) quite a lot in Nicole’s baked good recipes like this. I would use just a tad bit more as the recipe notes because it says on the carton to use more for it to rise properly. I usually have good luck with this option. For the book, maybe a riff of “Into the looking glass”? Holding your favorites up to the gluten free mirror. Too long, I know, but the idea is fun. Oh! And these “muffins”! Wow! I can’t wait to give these a go! This morning is ear marked to get some bread dough for baguettes in the fridge before work. Interesting idea, Laura! So smart to get that bread dough into the refrig before work. You can practically come home and bake! How about calling the book “Just Like the Original”?